It's time for men to break the stigma. 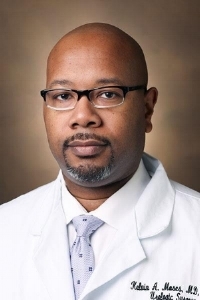 Dr. Kelvin Moses, Urologist at Vanderbilt University, shares why it's important to talk about prostate cancer screening. "That’s very important because men in general and certainly black men... are maybe afraid," said Dr. Moses to SmartBridge Health at the 2018 ZERO Prostate Summit. The statistics are grim when African Americans have the highest death rates for prostate cancer, according to the American Cancer Society. Meanwhile, only one-third of African-American men get a prostate screening after age 50. "Prostate function deals with sexual function and urinary function and maybe not everybody is comfortable talking about that," said Dr. Moses. Dr. Moses stresses the importance of getting comfortable talking about prostate cancer screenings because it can save a life. "At least talk about it with your physician, knowing your family history as well, and maybe even discussing it within your organization such as churches or fraternities, where men are congregating. And talk honestly about it because if you don’t talk about it, you don’t know. Then that stigma will always stay there." Dr. Moses also shares what to expect during a prostate cancer screening. Final advice from Dr. Moses to men: Get screened.